SMB was supposed to already catch up with the leaders this past week, but they got derailed by the Elasto-Painters last Friday and are now in solo third behind ALA and MER. SMB has a tough stretch ahead with STA & GIN after this game, so beating the Aces here will be a paramount objective. On the other end, ALA had to scramble past a short-handed GLO quintet to book their fifth win in six games, but they still managed to escape with a W and the #1 spot in the team standings. Winning over SMB here validates their status as a conference frontrunner, and it should really solidify their chances at a berth in the next round. With both teams really looking to come out with a win here, it’ll be an interesting power play between two of the deepest and most well-coached squads in the league. The status of June Mar Fajardo will certainly be significant for the Beermen, who will have to rely even more on import Tyler Wilkerson in case the reigning MVP is out of commission. Needless to say, guys like Arwind Santos and Marcio Lassiter will have to step up with big numbers. As for the Aces, they will probably continue to ride on the sublime skill-set of Calvin Abueva, but the The Beast may also not be 100% because of possible lingering effects of the ankle he sprained in their win over GLO. If that’s the case, guys like Vic Manuel, JV Casio, and RJ Jazul will be relied upon to step up. Of course, the main undercurrent in this encounter is that it will be a rematch of the two teams that figured in the historic 7-game Finals series of the 2015-2016 PHL Cup. We all remember how ALA led 3-0 and was just a few ticks away from the crown but they, instead, became the first basketball team ever to collapse for four straight games and lose the series and the crown. Now the Aces will be looking for a measure of payback for that infamous defeat. - Calvin Abueva looked like he was in bad shape when he sprained his ankle against the Batang Pier, but he bucked that injury to post a career game. That served to remind everyone of just how good he is and how he is the heart and soul of this ALA club. Now he will try to do that again against the team that gave him supreme frustration and devastation last conference. 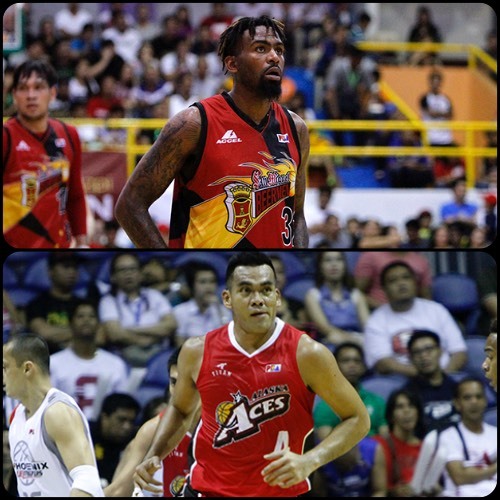 - Shane Edwards has been a great fit for the Aces lately (They haven’t lost since Edwards came in), and it’ll be interesting to see how he matches up with versatile SMB reinforcement Tyler Wilkerson. Edwards will need every bit of his sublime skill-set to match-up well with Wilkerson, who has been on a bit of a tear this conference. If Edwards can hold his own and, if need be, contain SMB’s dangerous frontcourt, the Aces should be in great shape. - Two reasons for ALA’s dominance so far are their ability to force turnovers and to get out in transition effectively. The Aces are the top team in forcing opponents to cough the ball up, and they are also tops in fastbreak points. They are #2 in points off turnovers, which further underscores how good this team is at turning defense into offense. SMB isn’t the most turnover-prone team in the league, but they will have to work extra hard to prevent the Aces’s D from making them commit errors. - Tyler Wilkerson (TW; T-Dub) has been nothing short of amazing for SMB. He has recorded a double-double and at least one three-pointer in each of his games so far, and that shows how versatile his game is. If JMF will be sidelined or hampered in this game, the pressure will be on Wilkerson to further stamp his class in this contest. 5. SMB: ASAN SI ARWIND? - If, indeed, JMF will be unable to make his presence felt in this contest, former MVP Arwind Santos will have to step up big time. He has been slowed down this conference, but he will need to muster his true talents for the Beermen to have a shot against the Aces. If Abueva has a great game for ALA, Santos will have to somewhat match that for SMB. - Despite having a tall squad, SMB has been on the short end of the rebounding battle this conference. They are, so far, -7 in terms of average rebounds per game this conference, and they can ill afford to continue letting opposing teams beat them on the glass. If JMF is unavailable in this match, pressure will mount even more for the likes of Espinas, Semerad, Reyes, and De Ocampo to help out Wilkerson and Santos on the boards. - These fiery forwards meet again, and it should be a duel to remember. Abueva has been named back to back player of the week, while Santos has been under the radar for SMB. Still, when these guys meet head to head, things get explosive and fireworks tend to happen, so it’ll be interesting to see who comes up with the upper-hand. Santos last game: 10pts, 5rebs, 3asts, 2blks, 3 triples, 3/9 FGs.